Deontae Harris shows his chipped tooth. 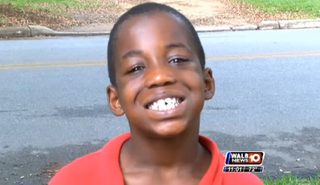 A Georgia mother is angry after a physical education teacher's disciplining of her son resulted in the young boy's front tooth getting chipped, WALB reports. According to the report, Sadeirdra Canady is not satisfied with how the school system is dealing with her grievance and says that she was not notified after the incident. "Any other time that Deontae Harris gets in trouble in school, they call and report it, you know, doing anything," the outraged mother said. "No one called; it was like they was trying to cover it up." According to the first-grader, he chipped his tooth when he was disciplined by his coach during an in-school suspension at Jackson Heights Elementary School last month. "He put me between his legs and spanked me, and after that he throwed me to the wall," the 8-year-old said, according to WALB. It was at that moment that his tooth was chipped. "I kept telling the coach that my mom didn't give y'all permission to whoop me, except the principal can," added the young boy, who said that the assistant principal also spanked him. Canady acknowledges that she gave permission only for the school's principal to dole out corporal punishment. "I'm trying to figure out why was the ISS teacher punishing him anyway," Canady said. According to WALB, school police and administrators are investigating the case. Canady hopes that the coach is disciplined.